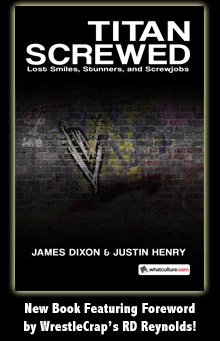 Someone Bought This: Show the world how much you love WWF Coliseum Videos! - WrestleCrap - The Very Worst of Pro Wrestling! Someone Bought This: Show the world how much you love WWF Coliseum Videos! 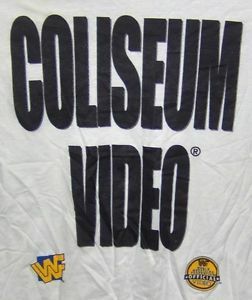 From around 1995, it’s an Official WWF Coliseum Video t-shirt! This shirt makes a simple, bold statement. And that stamens is “I love wrestling videos!”. That sounds like a good statement to me! SmackEmWhackEm.com! I bet that URL’s… probably taken. Someone Bought This: Coliseum Videos were expensive in the 80's! 7 Responses to "Someone Bought This: Show the world how much you love WWF Coliseum Videos!" This brought all the ladies to the floor in the year 19 and 95! I just checked the URL…it’s NOT taken! I would wear that shirt wherever I may roam. I love Coliseum Video o much, I have one of two of their non-WWE videos in my VHS collection. Those that wanted to stand out and get a real push would want to rock a Coliseum Video shirt. I still have about half a dozen WWF Coliseum Videos including the original Wrestlemania. They may be making a comeback – old WWE videos are starting to appear on the network! I know they already have Bloopers, Bleeps, and Bodyslams, and Wrestling’s Strangest Matches (where else can you see a Women’s Battle Royale? Oh, wait, there’s going to be one at WrestleMania…well, how about a 10-man Tag Team Match? What’s that – there’ are entire PPVs dedicated to them, you say? ).